Banca March is the only bank in Spain which is 100% family owned. Founded in 1926 by Juan March Ordinas, in Palma de Mallorca, his vision of a traditional banking model has led the bank to be the European leader in solvency in 2010 and 2011, moreover to be recognized in 2013 as “Best Private Banking Institution” at the IAIR European Awards. The need to preserve documentation generated by its branches, while maintaining easy access to the files, has prompted the bank to implement the Easy WMS Basic management software. The strategic business model of Banca March currently focuses on private banking, large companies and asset management, and is very focused on family businesses, as well as high income. In order to manage the large amount of documentation generated by its branches and at the same time meet the legal obligation to preserve record books, correspondence, documents and evidence relating to the business for a minimum period of six years, the bank needed to centralize all their documentation into a single warehouse as it was not possible to save these files in each branch due to capacity issues. In addition to conserving the documents, Banca March also needed to have quick and orderly access to any of the documents stored since they may be required to consult them at any point in time. The first step the bank has taken to resolve this need was to recruit the services of a logistics operations company, to create a document custody warehouse for all documentation generated by its branches. The second step has been to implement warehouse management software, the Easy WMS Basic from Mecalux, to control, manage and maintain all its files in perfect order. The warehouse designed for Banca March to save their documentation in is 1,000 m2 in size and has a maximum height of 7 m. The load units are boxes of 38x25x27 cm in size with an approximate weight of 15 kg/each. To accommodate all the boxes of documentation, the surface area of the warehouse has been optimized using M7 manual picking shelves from Mecalux that allows you to make use of the full height of the warehouse with the aid, in this case, of a trilateral forklift. In all, 17 M7 shelves with 8 work aisles have been installed, which offers a storage capacity of 50,850 boxes, for 39,800 different items. The warehouse also has a mixed reception dock with a buffer area attached. In order to manage the considerable amount of information generated, it is essential to use a warehouse management system that makes it possible to record all references, and check inventory and the locations of each item. Banca March has relied on Mecalux and its Easy WMS Basic to carry out this task. Create an item master record, wherein each item is unique and corresponds to the name of branch + month + year, spanning a maximum of 10 years per branch (most of the documentation past the legal period established by the “code of commerce”, which is a minimum of 6 years, will be destroyed). Reception: when the documentation is received from a branch, it is deposited into a box that is identified with a barcode label that corresponds to the location of the item, and another barcode label that corresponds to the ID number of container. This process of standard reception with Easy WMS Basic is performed mainly using the option of double blind reception. Location: a criteria of “chaotic location” is used (there are no pre-assigned locations and references can be located in any available spaces, resulting in maximized space usage). Entries are recorded with the standard Easy WMS Basic procedures to control the localization of the different items. Dispatch: Items sent out from the Banca March warehouse are done for two main reasons: request of a document by a branch, or for an item to be shredded. In all cases, the output operation of the full container (box) is carried out and never just one of the documents it contains. Operations are performed using the standard procedures of Easy WMS Basic. Banca March has met its storage needs, and the custody and control of the documentation generated by its branches without having to make a large investment. In addition to the M7 picking shelves, the infrastructure is complemented by a trilateral forklift equipped with a RF terminal, a wireless access point, a PC that acts as an Easy WMS Basic server and as a management console, and a barcode label printer. With these basic elements, the company can currently locate 50,850 boxes and manage 39,800 different items, controlling inputs/outputs, and the locations of each of these items. 1 day to configure the warehouse. 1 day for operational tests of procedures. 3 days for start-up and training. 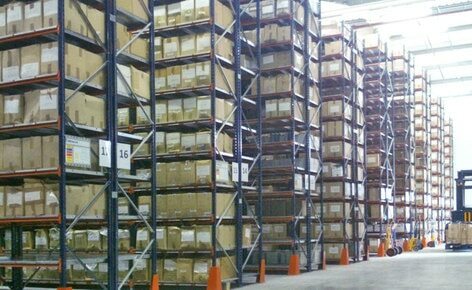 Mecalux has developed a solution tailored to the needs of the client, so that with an infrastructure and a minimum investment Banco March has met its goal of getting the maximum storage out of the surface area available, and achieving high performance and control of their document custody warehouse.